A giant blue planet is found, but the color could be due to glass particles in the hellish planet's hot atmosphere. Light from the planet HD 189733b was captured by the Hubble Space Telescope and analyzed. 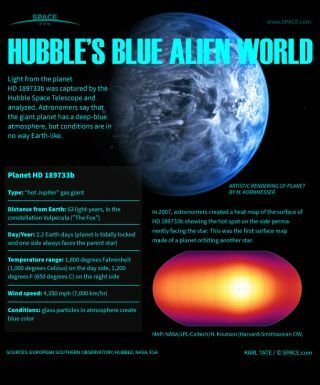 Astronomers say that the giant planet has a deep-blue atmosphere, but conditions are in no way Earth-like.